April 6th, 2010 | Packing Tips. I was helping my boyfriend unpack some boxes the other day. When he moved into my our home from his condo, he didn’t use a professional moving company. He chose to pack and move himself, which he thought was a perfectly good decision until we opened his boxes and saw the condition of his belongings. Delicate figurines from his worldly travels were, not so gracefully, thrown in with heavy textbooks and his karate certificates were crumbled beneath kitchen supplies. Decidedly, that’s the last time he uses his friends to help him move. Learn from my boyfriend’s mistakes. If you decide not to select a professional mover to pack your household goods, follow these tips to ensure your belongings arrive at your new home safely. Individually wrap each piece in several pieces of clean newsprint. Stack three to five pieces together and wrap the bundle. Always stand each bundle on its side. Never lay them flat. Create a second level by placing 3-4 inches of crumbled paper over bundles. Always pack larger items on the bottom and smaller items toward to top of the carton. Individually wrap and pack rim down on the very top layer of your carton. Never place one piece inside of another. 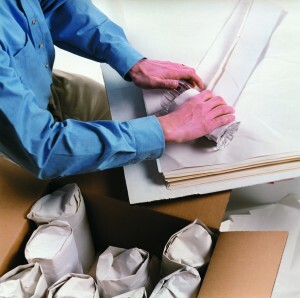 Pack especially fragile items in a smaller carton and place the entire carton in a larger, cushioned one. Wrap individually, nesting 2-3 bowls together before re-wrapping the entire bundle. Place the bundle in a carton on its side or flat and creating layers as you go. Your local Wheaton agent can provide you with special cartons that accommodate most items in this category. Place only one article in each container. Professional crating may be necessary for oversized or especially heavy items, such as table tops. Pack similar sized books together in smaller boxes alternating open edges with the bindings. Wrap hardback books and ones with fragile covers in clean newsprint. Remove the shade, bulb and harp. Wrap bulb, harp and base and place the base in an appropriate sized carton. Fit one shade in similar sized carton without placing newsprint in or around it. Take extra care with glass shades and chandeliers by having them professionally packed in sturdy crates. Cover mattresses to protect them from soil and damage in appropriate sized boxes, which are available from your Wheaton agent. Fold sheets, spreads and draperies and place in boxes or hang in wardrobe cartons.